To book a place in the course, please click here. To request further information on endoscopic training, please complete the form below. Join your practice for one or more weeks, carry out endoscopic training and locum work, if required. During this week(s) a ‘wide net’ will be spread and we can find possible corrective or exploratory cases for endoscopic practice. Train five clinicians plus one veterinary nurse or SQP of your team per week on the technique. The delegates can join the training sessions as they become available during the day or stay continually throughout the training week. We shall allocate time for theory, in-vitro practice and, of course, on farm practicals. Integrating with your team will offer you the best advice on how to manage the endoscopic kit and promote the service to your clients. The animals that are required for in-vivo training need, first and foremost, to benefit from the procedure. The procedure is modular. For example a two-step LDA correction, or RDA correction, always starts as a one-step LDA correction. Part of the course will be completed in-vitro in the classroom, and part in-vivo on the farm. 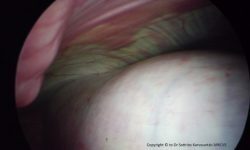 Ideally, per week, we shall need a mixture of up to five displaced abomasum and sick cows for corrective or exploratory endoscopy (check our “LDA Correction – Short Guide” here, Note: website registration required). A teaching room that can sit a minimum of eight people. Laptop, powerpoint projector, extension leads, flip-chart, marker pens, etc. Medicines, specifically local anaesthetic, sedatives, and any treatment against concurrent disease that the patient may require at the time. Consumables, for example 5ml and 30ml syringes, needles, gloves, disposable gowns and so on. 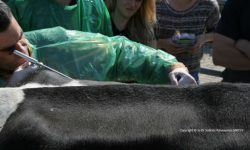 The bespoke Bovine Endoscopic training takes place at flexible times to suit your team, offering up to 16 hours CPD per veterinary surgeon and up to 8 hours CPD per nurse or SQP. To request further information on endoscopic training, or a breakdown of our charges, or details of our indemnity insurance, please complete the form below. If you have any questions or comments regarding the Training, please enter them here.